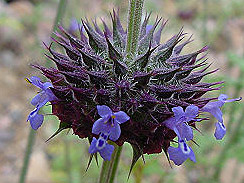 I first encountered this plant while hiking an Apple Valley trail. Its flower balls clued me that it must be sage, but its leaf shape was very different than any sage I’d seen before. It’s sometimes called golden chia, desert chia, or simply chia. Its seeds can be used for sprouting in the kitchen, like Salvia hispanica seeds (Chia Pet seeds). For some reason, this plant reminds me of violets, likely the purple-ish dark green leaves which seem a bit fuzzy. 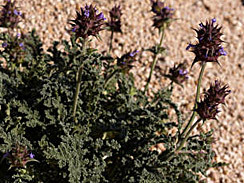 It grows close to the ground, perhaps 10″ to 2′ tall, producing only one to several flower balls per plant (unlike black sage which can produce hundreds). 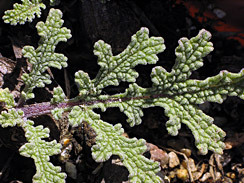 The leaves are irregularly rounded with very deep recesses.